If you like seductive poster taglines, try this one: "If you miss the first five minutes, you miss one suicide, two executions, one seduction, and the key to the plot." Such was the hook for the 1970 espionage thriller The Kremlin Letter. In this star-studded, black-hearted spy thriller directed and co-written by the legendary John Huston (The Maltese Falcon, The African Queen, Wise Blood), a potentially catastrophic diplomatic letter from the CIA must be recovered at all costs. Drafted in is Rone (Patrick O'Neal), a young agent with a photographic memory, to make his way through a treacherous maze of shadowy cities and shady characters. 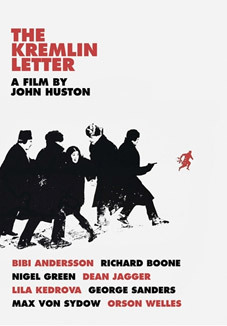 Described by legendary French filmmaker Jean-Pierre Melville (Le Samouraï) as "magisterial", and featuring an astonishing cast including Orson Welles, Max von Sydow, George Sanders, Bibi Andersson, and Richard Boone, he Kremlin Letter is a brutal, level-headed examination of espionage, leaving behind any trace of gadgetry or glamour, based on the acclaimed novel by Noel Behn, drawn from his work within the U. S. Army Counterintelligence Corps. The long unavailable The Kremlin Letter makes its UK DVD debuton 25th July 2011, courtesy of Eureka Entertainment att the RRP of £16.34. Featuring a new, high-definition transfer in the film's correct 2.35:1 aspect ratio and English subtitles for the deaf and hearing-impaired, this looks to be a movie only release.